Conservative, liberal, and moderate editorial cartoonists' biting takes on the early-January 'polar vortex' and the spectacle of a Russian research vessel ice-bound while researching climate change in Antarctica will make readers laugh ... and also weep. How cold was it in much of the eastern U.S. in that first full week of January? 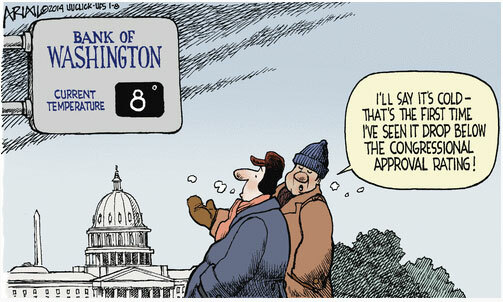 So cold, editorial cartoonist Robert Ariail joked, that the temperature numbers on temperature/time signs outside many banks were lower than the most recent approval numbers for Congress. That was one of the gentler jabs at the now seemingly unbreakable link between weather and politics in the U.S. Other cartoons and op-eds illustrated just how frozen positions in the debate over climate change have become. But there were also some hopeful signs: moderates did not buy into the “global warming is dead” story (see below) and many outlets carefully explained the workings of the polar vortex and what we know and don’t know about links between climate change and extreme weather. Rather like the instant-replays and color commentary on display in NFL playoff games, news coverage of dramatic weather events now includes on-the-spot analysis and post-“game” reflections. For this analysis of coverage of the new-year cold snap, The Yale Forum focused on editorial cartoons published since December 30th. Most were drawn from gocomics.com, a website that collects cartoons from a variety of sources and then sorts them by political leaning. The site includes the work of 25 editorial cartoonists “on the left,” 12 “in the middle,” and 14 “on the right.” The Yale Forum also reviewed cartoons posted since the start of the year at the website for the social-conservative aggregator, Townhall.com. This brought in work from four more cartoonists. 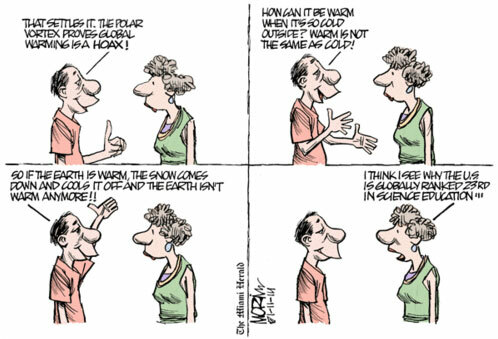 From these two sources, The Forum gathered a total of 48 cartoons that addressed weather or climate in the first two weeks of January 2014. This total broke down as follows: on the left — 18 cartoons; in the middle — 8 cartoons; and on the right — 22 cartoons. The first flurry of cartoons originated on the right, in response to news that a Russian research vessel* carrying approximately 50 scientists and volunteers, the MV Akademik Shokalskiy, had become trapped in ice off the coast of Antarctica. When conservatives learned that the group was also engaged in documenting changes in the region’s climate, they relished the irony. Cartoonist Eric Allie thought the mainstream media were downplaying the climate connection. His cartoon for January 5th compared climate activists to radical Islamists who were prepared to attack those who questioned the truth of their faith — including the press. Then came the polar vortex. The 40 cartoons drawn in response to the wave of cold air that froze the eastern United States in the first full week of January can be sorted into three groups: humorous illustrations of life in cold times, the cold as metaphor for other matters, and challenges to or defenses of the scientific consensus on global warming. The overall numbers are revealing. Those in the middle were least likely to make the cold wave into an issue — or an analogy for an issue. Of the moderate cartoonists, 63 percent took the illustrative approach — “How cold was it?” By contrast, only 25 percent of conservative cartoonists just joked about the cold; 65 percent saw the Shokalskiy episode and the polar vortex as opportunities to raise questions about the validity of climate change. Liberal cartoonists fell in between these two groups: 35 percent simply found humor in the cold, while 41 percent rebutted conservative attempts to use the cold to discredit the consensus. And like conservative cartoonists, who used the cold snap to comment on an economy in “deep freeze,” liberal cartoonists drew analogies between the cold snap and Washington politics: the “paralyzing chill descend[ing] on Washington” with the return of Congress and the cold hearts of those voting against extending unemployment benefits. On the whole, however, conservatives responded to the ice and the snow both more quickly and more aggressively. How Stupid (Or Crazy) Can They Be? In the course of mocking the claims of the opposing sides of the debate, a third of these cartoons questioned the intelligence or sanity of their opponents. Jerry Holbert could not resist the opportunity afforded by the aptly titled animated feature in movie theatres during the week of the polar vortex. “I think it’s a new film from Al Gore on global warming,” says a husband to his tightly bundled wife about the “Frozen” on the marque. Nearly eight years after An Inconvenient Truth, Gore is still a prime target for climate skeptics. Liberals and moderates responded in kind. “All across America, low intelligence records are being broken,” says the reporter in Mike Luckovich’s cartoon for January 8th. Two “in the middle” cartoonists, Nick Anderson and Steve Breen, questioned the intelligence of skeptics by suggesting their heads were empty or numb. In this sample of cartoons, liberals and moderates did not argue that the polar vortex was evidence of climate change — only that it did not disprove climate change. 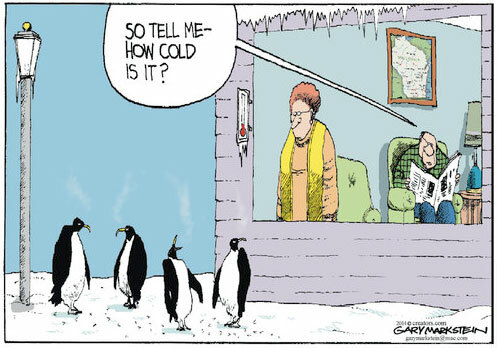 One cartoon by “on the left” cartoonist Tim Eagan, however, contrasted the warm temperatures in parts of the Arctic with news of the freeze in the Northeast. Two conservative cartoonists seemed to agree that the weather was becoming disconcertingly weird. 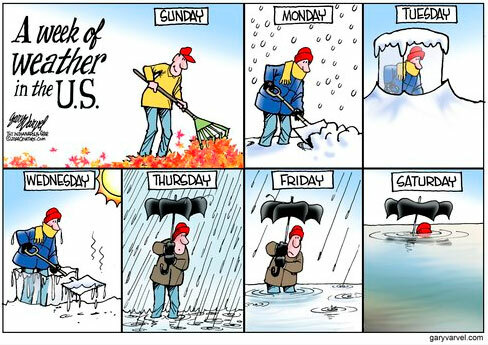 One, Chip Bok, described the polar vortex as “like a Derecho, but cold.” The other, Gary Varvel, illustrated a week of remarkably varied weather. But Varvel’s point may have been the same one made by many columnists across the political spectrum who corrected their more excitable readers (and colleagues). For the Politico’s Matt Daily (“Polar Freeze: It’s Weather, Not Climate“), and perhaps for the editors at The Wall Street Journal (“It Isn’t Climate Change” — login required), these op-eds were necessary efforts to re-draw an important distinction. 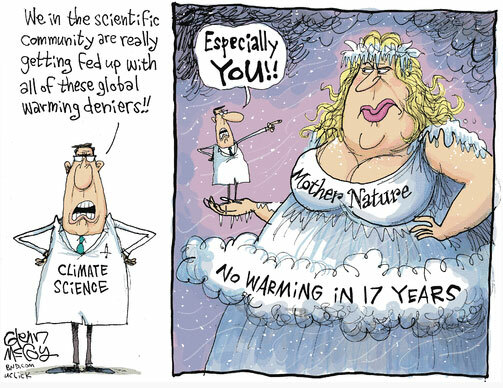 Of the conservative cartoonists sampled for this study, only Eric Allie and Glenn McCoy seem willing to venture this far into climate denialism. McCoy’s cartoon for January 6th offers a prime example — and highlights one of two numbers now circulating in the conservative mediasphere. Conservatives have long trumpeted the fact that average annual global temperatures have not exceeded the high reached in 1998, when an exceptionally strong El Niño produced a striking spike in the trend line. And even those who might point out that 2010 and 2005 did, in fact, have higher annual averages would acknowledge that they were only marginally higher. But this does not add up to “no warming”; the average global temperature for the decade 2000-2009 was higher than the average global temperature for the previous decade. The more surprising error is a simple mathematical one. One gets to 17 years only by including 1998 and 2014 in the count. If 1998 is the point of comparison and 2014 has barely started, then, even exempting the anomalies noted above, only 15 years have passed with no significant increase over the exceptional high reached in 1998. Nevertheless, one cannot dispute the conservatives’ main point: average annual global temperatures have thus far not exceeded the high reached in 1998 by any significant amount. Observed temperatures and model predictions have begun to diverge, a problem regularly addressed in the scientific literature. Both of these statements assess climate science on an all-or-nothing basis. And one loses the opportunity to make corrections if, when predictions begin to diverge from observations, one scraps the entire model — or 114 models. Nonetheless, these two numbers, 17 years and 97 percent, will likely be seen many more times in 2014. Climate change communicators may have to learn how to deal with them. Or not. A just-released study suggests that the influence of cold weather on public opinion about climate change is limited. The authors, Stuart Capstick and Nicholas Pidgeon, found that only those highly skeptical about climate change to begin with perceive cold weather events as evidence against climate change. The analysis of editorial cartoons and op-eds completed here has yielded results in line with Capstick and Pidgeon’s findings. 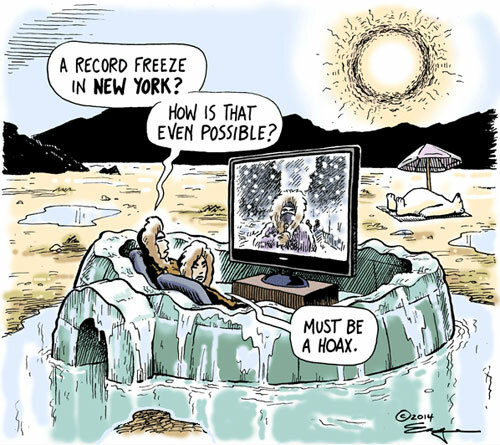 Although some left-leaning news sources did draw connections between the polar vortex and climate change, most moderate and liberal sources of news and opinion, including editorial cartoonists, maintained the distinction between weather and climate. 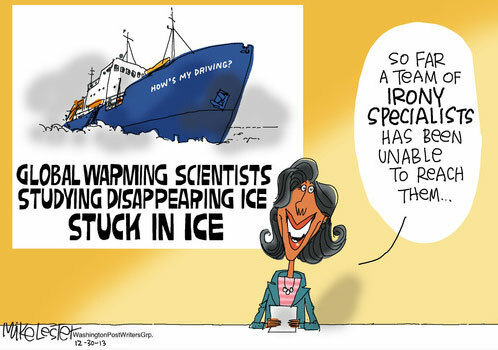 It was conservative cartoonists, and not even all of these, who tried to use the MV Akademic Shokalskiy episode and the polar vortex to discredit the science on climate change. The effects of their efforts, too, may well prove to be limited — at least beyond the conservative mediasphere. *Editor’s Note: This sentence edited 1/16 at suggestion of, and thanks to, a close reader’s correcting the previous term “icebreaker.” We appreciate the close read and timely correction.